Like other dangerous predators, crocodilians cause reflexive fear in humans, perhaps because the fear of being eaten is greater than the fear of being bitten. Many animals will bite, but only a few see humans as prey to be eaten. Of the 23 species of crocodilian, 8 are known to carry out unprovoked attacks on humans. Of these species, attacks by the Saltwater Crocodile (C. porosus), Nile Crocodile (C. niloticus) and American Alligator (A. mississippiensis) are best known. Less commonly implicated in attacks are: Black Caiman (M. niger), Morelet’s Crocodile (C. moreletii), Mugger Crocodile (C. palustris), American Crocodile (C. acutus) and the Gharial (G. gangeticus). Two unprovoked, directed attacks by Australian Freshwater Crocodiles (C. johnstoni) on humans are considered to have been cases of mistaken identity. The incidence of crocodilian attacks on humans in many countries is very difficult to quantify. There is little doubt that many more people are attacked than is reported, as many attacks occur in remote areas. Accurate data collection does not usually occur until a species is legally protected and formal monitoring is introduced. For example, in northern Australia, details of Saltwater Crocodile attacks prior to 1971 (year when the species was protected) are lacking, yet records after 1971 are detailed and complete. Interestingly, the recent increases in reports of attacks by Saltwater Crocodiles in Papua New Guinea are thought to be in part due to better communication being available to people living in remote areas - namely mobile telephones! Why do crocodilians attack humans? Hunting for food: All crocodilians are opportunistic feeders, eating a wide range of prey. With increasing body size, crocodilians shift to larger prey, and humans are well within the size range of prey that can be taken by large crocodilians. Defence of territory: Some species, such as Saltwater Crocodiles, are highly territorial, and will defend their territory against intruders, including humans. Defence of nest and/or young: Most crocodilian species exhibit some form of nest defence. Exceptions are Australian Freshwater Crocodiles and some smaller caiman species which in the wild do not defend their nests, but may do so when in captivity. At the other extreme, female Saltwater Crocodiles will vigorously defend their nest to deter predators and/or intruders, whereas other species are far less likely to do so against humans. Crocodilians will also react to distress calls (vocalisations) made by their young. Mistaken identity: It is possible that some attacks may be directed at dogs or other animals accompanying people, with the latter were bitten by mistake. The most comprehensive datasets on attacks are available for the Saltwater Crocodile (C. porosus), Nile Crocodile (C. niloticus) and American Alligator (A. mississippiensis). Some of the available data on unprovoked attacks by these species have been summarised here to provide a comparison. Most data for the Saltwater Crocodile and the American Alligator are drawn from single sources respectively, but data for Nile Crocodile are from a variety of sources. The worst mass attack by crocodiles allegedly occurred on the night of 19 February 1945, when approximately 1000 Japanese soldiers found themselves pinned down in a mangrove swamp separating Ramree Island from the Burmese mainland. Only 20 Japanese allegedly escaped alive from the Saltwater Crocodiles in the swamp. However, the veracity of this report has recently been questioned. A 5.8 m long Saltwater Crocodile named “Whiteback” (due to distinctive white markings on his back) gained considerable notoriety in Sarawak, Malaysia, after killing 13 people. After years of failed attempts, Whiteback was finally caught in May 1992 after he had claimed his last victim - a 30-year-old woman. 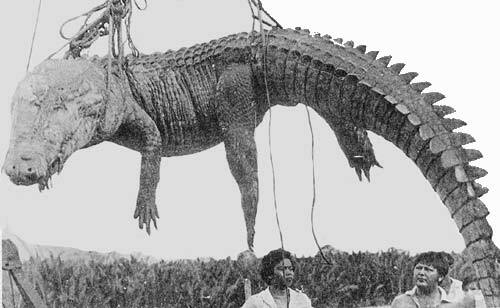 Whiteback is one of many documented man-eating crocodiles from Sarawak. The local Iban people generally tolerate crocodiles, even large ones, until they kill a person. There is little doubt that the Nile Crocodile is responsible for more attacks on humans than any other crocodilian species. After lions and hippos, the Nile Crocodile causes the highest numbers of wildlife-related fatalities in Africa. It is difficult to estimate the total number of attacks per year as many non-fatal attacks go unreported, but it is believed to exceed 300 per year since the year 2000 (eg Namibia 8/y; Zambia 22/y; Kenya 13/y). Although responsible for far fewer attacks, the Saltwater Crocodile appears to get relatively more media attention, perhaps due to the large sizes that male “salties” reach (>5.1 m). The number of attacks by Saltwater Crocodiles, throughout the species’ range, is estimated to be around 20-30 per year in recent years. In many countries, numbers of attacks are increasing, largely due to increasing (recovering) populations of crocodilians. Mean number of American Alligator attacks per year for 5-year periods (1946-1950 to 2001-2005) in Florida, USA. Mean number of Saltwater Crocodile attacks per 5-year periods (eg 1971-1975 to 2006-2010). Saltwater Crocodiles were legally protected in Australia in 1971-74. The most complete data sets are available for Saltwater Crocodiles in Australia and American Alligators in Florida, USA (where >90% of attacks in the USA have occurred). 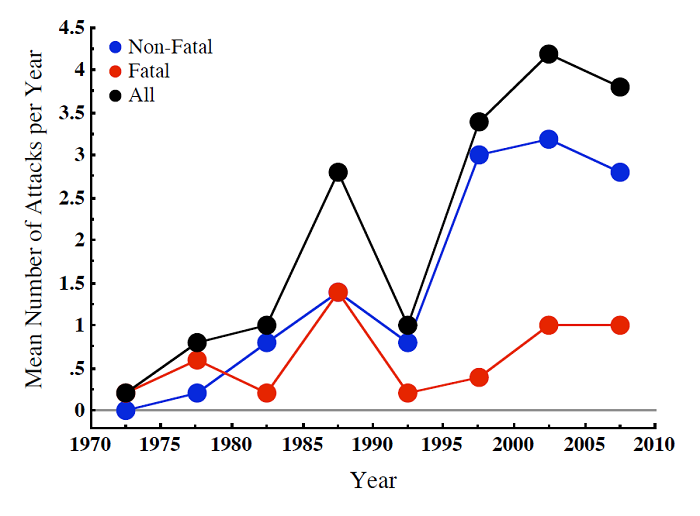 Notwithstanding changes in human population due to tourism and other factors, the average number of attacks per year (2000-2007 period) relative to the crocodilian and human populations suggests less interaction between people and alligators. Due to the lower human population and longer periods of cooler weather in Louisiana, there have been very few attacks there relative to the heavily populated State of Florida. On the other hand, in the sparsely populated Northern Territory and far north Queensland of Australia, the number of attacks by Saltwater Crocodiles has been relatively higher. Some sophisticated crocodilian management programs include mechanisms for dealing with crocodilians that are considered a threat to people and/or livestock. In the Northern Territory of Australia some 220-240 “problem” Saltwater Crocodiles (0.5 to 4.6 m total length) are removed annually from Darwin Harbour by wildlife rangers, to improve public safety. Crocodiles are captured alive, mostly in baited traps, and removed to crocodile farms to be used as raising or breeding stock. A tendency for relocated individuals to return to their site of capture means that relocation is not an effective management tool. The Florida Wildlife Commission receives some 17,000 complaints each year about “nuisance” American Alligators. In 1987 a formal nuisance alligator program was established, and more than 6000 are now captured and removed annually (around 91,000 nuisance alligators were harvested between 1977 and 2001). Private trappers are used to perform this service - they are compensated for their time and effort through the sale of skins and meat. A similar system operates in the State of Louisiana. A database on crocodilian attacks on humans is maintained by Dr. Richard Fergusson (Africa), and a more comprehensive online database has now been developed [www.crocodile-attack.info; see Sideleau and Britton (2012, 2013)]. The collation and analysis of such data will assist conservation and management efforts by allowing us to understand the nature of attacks. Caldicott, D.G.E., Croser, D., Manolis, C., Webb, G. and Britton, A. (2005). Crocodile attack in Australia. An analysis of its incidence, and review of the pathology and management of crocodilian attacks in general. Wilderness and Environmental Medicine 16(3): 143-159. Conover, M.R. and Dubow, T.J. (1997). Alligator attacks on humans in the United States. Herpetological Review 28: 120-124. Fergusson, R. (2004). Preliminary analysis of data in the African human-crocodile conflict database. Crocodile Specialist Group Newsletter 23(4): 21. Langley, R.L. (2005). Alligator attacks on humans in the United States. Wilderness and Environmental Medicine 16(3): 119-124. Sideleau, B. and Britton, A. (2012). 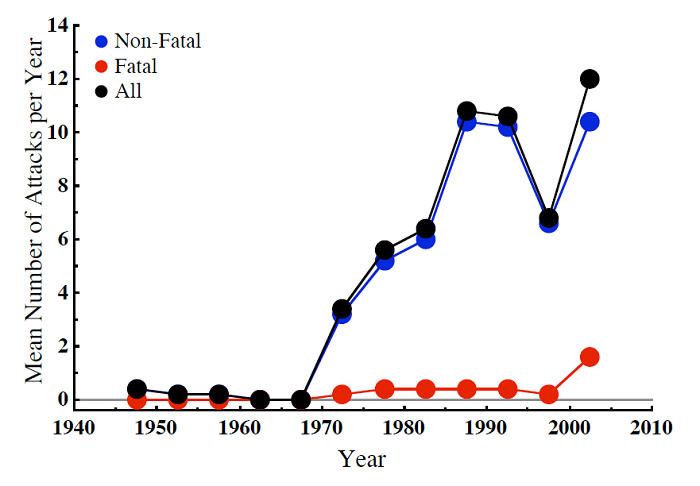 A preliminary analysis of worldwide crocodilian attacks. Pp. 111-114 in Crocodiles. Proceedings of the 21st Working Meeting of the IUCN-SSC Crocodile Specialist Group. IUCN: Gland, Switzerland. Sideleau, B. and Britton, A. (2013). An analysis of crocodilian attacks worldwide for the period 2008-July 2013. Pp. 110-113 in Crocodiles. Proceedings of the 22nd Working Meeting of the IUCN-SSC Crocodile Specialist Group. IUCN: Gland, Switzerland. Behra, O. (1996). Reports of crocodiles attacks on people in Madagascar 1990 to 1996. Crocodile Specialist Group Newsletter 15(3): 3-4. Bustard, H.R. and Singh, L.A.K. (1982). Gharial attacks on man. Journal of the Bombay Natural History Society 78: 610-611. Edwards, H. (1998). 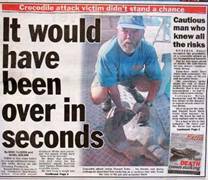 Crocodile Attack in Australia. J.B. Books: Marleston, Australia. Evans, P. and Wilkinson, P. (1997). Black Caiman attack. Crocodile Specialist Group Newsletter 16(3): 5-6. Finger, A.G., Rainwater, T.R., McMurry, S.T., Platt, S.G., Rosado, N., Windsor, M. and Mazzotti, F.J. (2002). Human-crocodile conflict in Belize: a summary. Pp. 198-199 in Crocodiles. Proceedings of the 16th Working Meeting of the IUCN-SSC Crocodile Specialist Group. IUCN: Gland, Switzerland. Hall, P.M. (1991). Dangerous to man? A record of an attack by a Black Caiman in Guyana. Herpetological Review 22: 9-11. Hines, T.C. and Keenlyne, K.D. (1977). Two incidents of alligator attacks on humans in Florida. Copeia 1977(4): 735-738. Huerta-Ortega S.M. and Ponce-Campos, P. (2002). Interaccion hombre-cocodrilo en la costa de Jalisco, Mexico. Pp. 200-203 in Crocodiles. Proceedings of the 16th Working Meeting of the IUCN-SSC Crocodile Specialist Group. IUCN: Gland, Switzerland. Kar, S.K. and Bustard, H.K. (1983). Saltwater crocodile attacks on man. Conservation Biology 25: 377-382. Marlin, J.A., Marlin, K.K. and Platt, S.G. (1995). A documented case of an attack by Morelet’s Crocodile (Crocodylus moreletii) on man. Bulletin of the Chicago Herpetological Society 30: 165-167. Platt, S.G., Ko, W.K., Kalyar Myo, M., Khaing, L.L. and Rainwater, T. (2001). Man eating by estuarine crocodiles: the Ramree Island massacre revisited. Herpetological Bulletin 75: 15-18. Pooley, A.C., Hines, T. and Shields, J. (1989). Attacks on humans. Pp. 172-186 in Crocodiles and Alligators. Weldon Owen: New York. Richardson, J. and Livingstone, D. (1962). An attack by a Nile crocodile on a small boat. Copeia 1962(1): 201-204. Ritchie, J. and Jong, J. (1993). Bujang Senang Terror of Batang Lupar. Samasa Press: Kuching. Steubing, R. (1983). Sarawak’s killer crocodiles. Malayan Naturalist37: 17-23. Steubing, R., Ismael, G. and Sallih, K. (1985). On the Possible Causes of Crocodile Attacks in Batang Lupar, Sarawak. University of Malaysia Sabah Campus: Kota Kinabalu. Stringer, C. (1986). The Saga of Sweetheart. Adventure Publications: Darwin, Australia. Vyas, R. (1993). Recent cases of man-eating by the Mugger (Crocodylus palustris) in Gujarat State. Hamadryad 18: 48-49. Webb, G. and Manolis, C. (1989). Crocodiles of Australia. Reed Books: Sydney. Webb, G.J.W., Yerbury, M. and Onions, V. (1978). A record of a Crocodylus porosus (Reptilia, Crocodylidae) attack. Journal of Herpetology 12: 267-268.